At first I thought we were getting a subtle glimpse of San Fierro in Grand Theft Auto V, but now I'm not so sure. The bridge in this shot, one of a dozen screens Rockstar released yesterday, doesn't bear enough of a resemblance and the location is out of whack. Hell, I was hoping that colonnade at lower left was a rebooted Jizzy's Pleasure Dome. Alas. 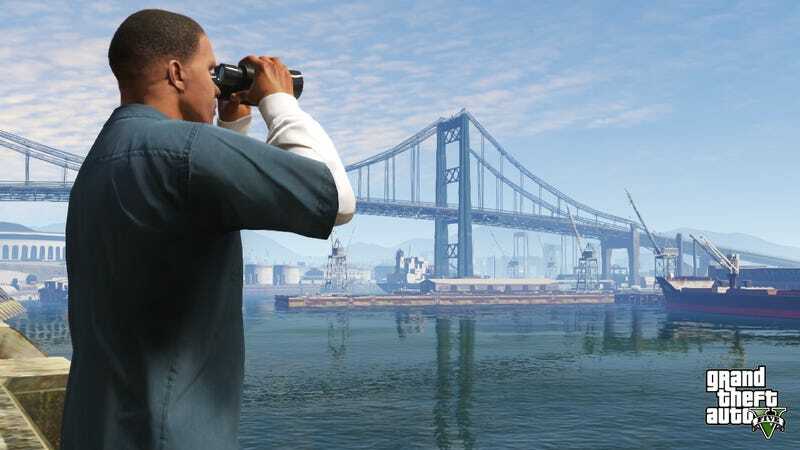 That said, have we heard anything about San Fierro in this game? Hell, if Rockstar was saying this world would be bigger than the worlds of Red Dead Redemption, GTA IV and GTA San Andreas combined, you've got to figure S.F. joins the discussion at some point. Check out the other 11 screens below, and get to speculatin' on any hidden meanings or ties to the old San Andreas you see. I spent a lot of time in that game, but I stink at spotting these kinds of clues. [Update] Alert reader Jason makes a compelling case for Oakland. That's the Coliseum at lower left and the Bay/Garver Bridge going across the water. Told you I stink at spotting these clues. Hell, I used to live in the Bay Area.